You scream, I Scream, we ALL scream for ice cream. 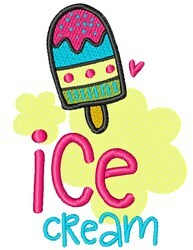 Sew this cute ice cream & quote design onto a child's tank top or cap for summer. Easy Embroidery is happy to present Ice Cream Desserts machine embroidery design which has 11579 stitches and is [69.68 mm x 98.13 mm] large. If you would like to view more embroidery patterns please search on our embroidery designs page.